It's been a while since I blogged, but some things never change! It's snowing again. Although I usually like snow, it's April. We've had enough! Bring on the sunshine! All three girls in school has given more free time...to do laundry! Ha! We are all so ready for summer and planning our vacation has been fun! A week at the beach is just what we all need. Too bad we have to wait until July! It looks like I'll be spending the rest of this weekend at home while everyone recovers from the latest virus. Hopefully by next week everyone will be feeling good and the weather will get warmer! I have been on a long blogging break, but with my youngest really starting to get excited about activities and projects and me having a little bit of extra time I am hoping to jump back in. 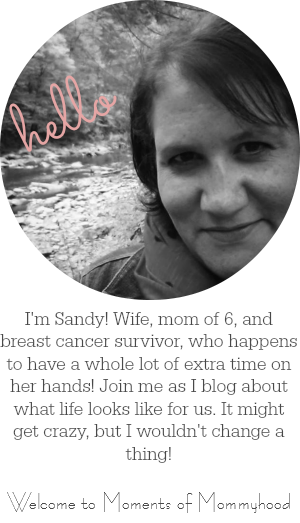 I love seeing your blog and looking forward to reconnecting with some of my favorite bloggers again!! It's good to see you again! I've been wanting to get back into things full time again. My girls are all in school now, but I do plan to be posting our adventures more frequently when summer is here. Looking forward to reconnecting!